Microsoft announced a refreshed Xbox One S at E3 2016. 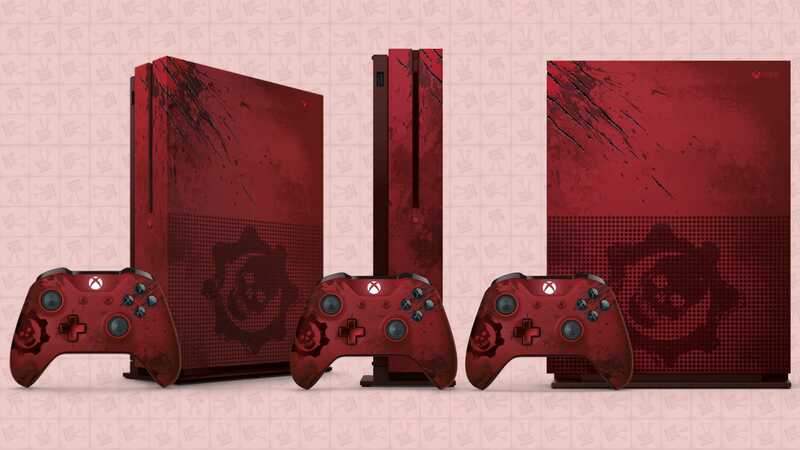 Now the Seattle based giant has revealed a special limited edition, blood soaked, Gears of War 4 Custom Xbox One S.
It is no secret that Microsoft enjoys creating unique and ‘fun’ hardware for its Xbox brand. In fact, it has become a bit of a tradition for them to do so, one that was formed during the Xbox 360’s prime. With the upcoming release of Gears of War 4, Microsoft and The Coalition have teamed up to produce a series of new hardware based on the Gears franchise. As such, the reveal of the brutally gorgeous Gears of War 4 Xbox Elite Controller has been complemented by the news of a new and limited edition Gears of War 4 Custom Xbox One S.
The limited edition Gears of War 4 Custom Xbox One S has all of the same features as its normal counterpart. Namely a smaller form factor, integrated power supply, and a 4K Ultra HD Blu-ray player and High Dynamic Range (HDR) support for videos and games. The difference, however, lies in the paintwork. 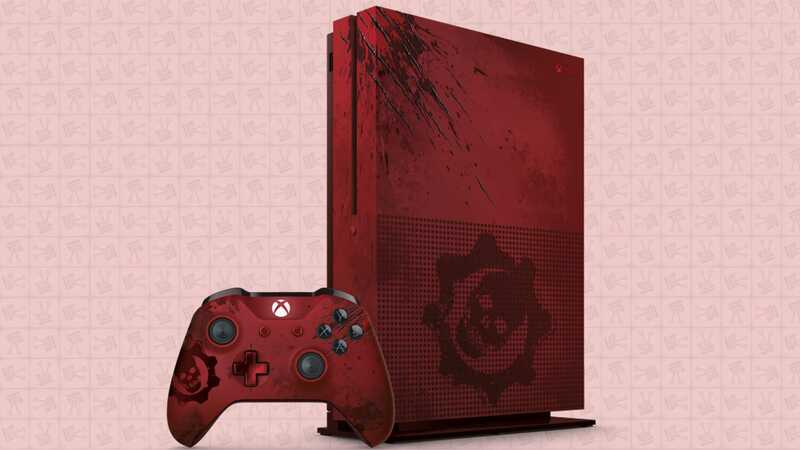 Through a unique design collaboration between The Coalition and the Xbox Design Team, the new limited edition console looks like something straight out of a Gears of War game. The stand out feature off the special console is how it bears the battle marks of surviving a desperate fight against the ferocious new enemies in Gears of War 4 – the Swarm. This bundle is, no doubt, a labour of love, as the console and accompanying controller are filled with incredible little details. From the laser-etched scratches, to the bloody thumbprint on the controller’s red metallic D-pad and the iconic Crimson Omen, Microsoft looked closely at what they could do with each piece of hardware. The result is a stunning and truly unique Xbox One S, one that is an absolute must for any fan of the Gears of War franchise. The bundle also includes in-game content, starting with the exclusive Vintage Oscar Elite Gear Pack, which features Vintage Oscar, the Vintage Retro Lancer, Vintage Boomshot and more. It also includes the Pre-Order Vintage Del Gear Pack plus six additional Gear Packs to make sure that fans are fully stocked for battle. Alongside the Gears of War 4 Custom Xbox One S is another limited edition controller that has been designed after J.D. Fenix, the son of Marcus Fenix. 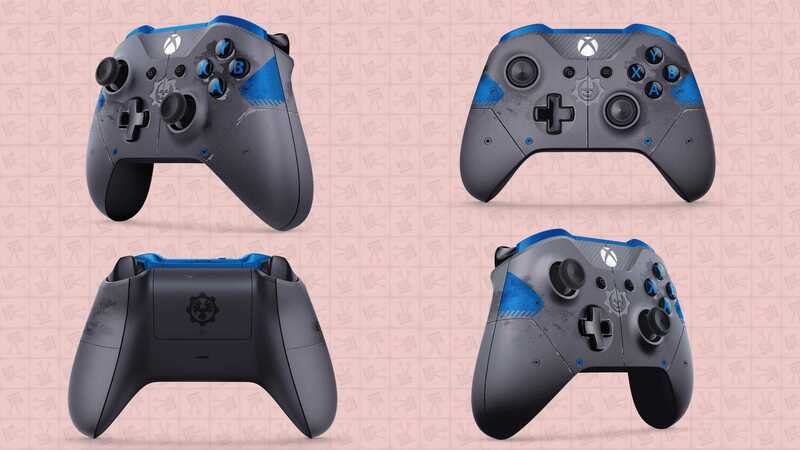 The all-new Xbox Wireless Controller Gears of War 4 JD Fenix Limited Edition is designed after JD Fenix’s armour and features metallic blue accents and textured grip for enhanced controls. It also features the COG logo (the Phoenix Omen). Both the JD Fenix and Crimson Omen controllers come with three Gear Packs containing in-game items and an exclusive multiplayer lobby emblem – a different one for each controller. The Crimson Omen and JD Fenix Limited Edition Xbox Wireless Controllers will be available for $74.99 USD (R1200) starting 13 September 2016. The limited edition Gears of War 4 console and controllers will be available from mid-September in the following markets: United States, Canada, United Kingdom, Ireland, Italy, Australia, New Zealand, Austria, Belgium, Denmark, Finland, France, Germany, Netherlands, Norway, Portugal, Spain, Sweden, Switzerland, Czech Republic, Greece, Hungary, Poland, Slovakia, and Turkey. 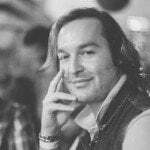 No word yet on a local South Africa release. Gears of War 4 launches worldwide on 11 October, 2016 (or on 7 October 2016 for gamers with early access via the Gears of War 4: Ultimate Edition).